With the release of NX 18-200mm F3.5-5.6 OIS iFn lens, you might be pretty eager to replace your kit lens. Or you might be contemplating getting the NX 50-200mm F4-5.6 lens instead. In this post, I will share with you the benefits and constraints of the different lens combination. No doubt the 18-200mm is the one lens that you should ever need on a camera. But there are reasons why you don’t see them being used as much as the kit lens. One main reason: size. Many users might be happy with the 18-55mm range. But if you find yourself wanting to zoom in closer during most shoots, then you would probably should consider getting this lens, to save the hassle of changing lenses during shoots. What, then, is the benefit of getting 2 lenses instead of one? One main reason: price. With the kit lens already part of your NX camera package, getting another 50-200mm would not cost you as much as the 18-200mm. Having 2 separate lenses to cover the entire focal length also means you have the choice of picking your lenses to carry with you and losing some weight. If price and size are not of concern, then here are some technical differences to highlight. The table below shows the different maximum aperture when the lenses zoom in. The maximum aperture value changes for some zoom lenses because the lens barrel extends as you zoom, resulting in reduction of the effective aperture. Simplistically speaking, less light enters the lens as the lens barrel extend, so the aperture becomes “smaller” and shutter speed is reduced. The reason why camera makers make variable aperture lenses is to reduce cost and weight so that general consumers can afford photography. Fixed-aperture lenses are very costly, and in the case of 18-200mm, practically impossible to achieve. So what does the chart say? It says that the maximum aperture for 18-55mm reduces slightly faster than 18-200mm. For instance, at 45mm, the 18-55mm maximum aperture is F5.6, whereas the 18-200mm maximum aperture is F5.0, offering a third-stop advantage. Not much, really. 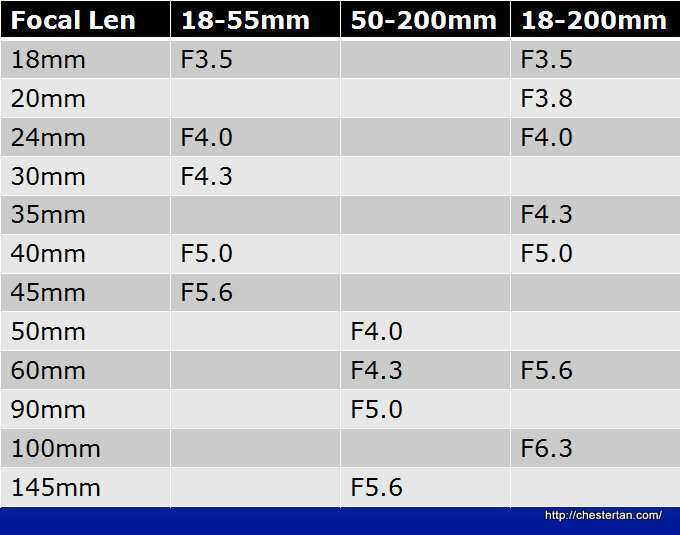 But comparing to 50-200mm, the 18-200mm maximum aperture is already F5.6 at 60mm whereas the 50-200mm is barely F4.3. That means the 50-200mm will let you shoot at faster shutter speed than 18-200mm at same focal length. And that’s certainly an advantage. Note also that the 18-200mm hits F6.3 at 100mm, while the 50-200mm reaches F5.6 from 145mm. So the 50-200mm is a brighter lens throughout the range compared to 18-200mm. But wait, there’s more. The minimal focal distance for 18-200mm is 0.5m. The minimal focal distance for 18-55mm is 0.28m. The minimal focal distance for 50-200mm is 0.98m. Based on the figures, it means that you can shoot closer with the 18-55mm than 18-200mm, which in turns shoots closer than 50-200mm. Therefore, the 18-200mm lets you zoom in and shoot at objects closer than with 50-200mm zoomed in at 200mm. However, at 18mm focal length, the 18-55mm would allow you to get closer than 18-200mm. It’s a give-and-take situation. The 18-55mm and 50-200mm lenses do what they do best. 18-55mm lets you focus closer at objects, and the 50-200mm lets you shoot at bigger aperture. The 18-200mm lens covers the entire focal length in a size of 50-200mm lens. There is no substitute for quality: an all-in-one lens like 18-200mm is bound to have limitations to fit into the size that it is. But it definitely offers the one benefit that all photographers desire: zoom coverage. If you find it a hassle to switch lenses and can overlook the slight technical limitations, then this is the time to own the new NX 18-200mm F3.5-6.3 OIS iFn lens. If you are interested in the NX prime (fixed-focal) lenses, here is the post. Join my Facebook photography page.